A YEAR OF JUBILEE REVIEWS: Pumpkin Prayer-Review and Giveaway!! Fall is truly in the air, with the beauty of the ever changing trees, the earlier sunsets, and the crispness of the mornings. My very favorite time of the year!! Beautiful Board book with fuzzy leaves on the cover! My first thought when I took it out of the mailer was wow, what a clever book! The illustrations are great with little mice praying, riding on leaves and climbing ladders. Fantastic for little ones to see the mice enjoying the blessings of Autumn. The illustrations make this book for me honestly! My three year old consistently looked through the book and wanted me to read it over and over to him. Delightful in that it mentions things of the fall season, but doesn’t go into Halloween, something our family has chosen to not celebrate. 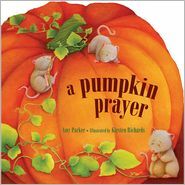 A Pumpkin Prayer – Little ones will delight in the wonders of this special time of year and learn to be thankful to God for His blessings. I received a copy of this book from Tommy Nelson in exchange for an honest review. My kids and I just took a walk and made a collection of things in nature. Leaves already beginning to change color is a big favorite. My kids would love this book thanks! We just had our first child, so we'll be going up to Michigan to visit with both sets of grandparents this fall!